This was the last German fighter deigned and built by Anthony Fokker during World War I. He ended the War as he started, with a monoplane design. Unlike his earlier 1916 Fokker E-III “Eindekker”, this one had a cantilever wing and had no external bracing wires. It had been designed to take advantage of an abundance of rotary engines that were available and offered much improved visibility over the biplane design. Because it arrived in the last few weeks of the War it did not have very long to prove itself. Using a thicker than normal airfoil section for the period, Fokker created a wing that was internally strong enough to not need external bracing wires or struts. Pilots were initially distrustful of the non-braced wing design but it gained favor as a good replacement for the Fokker Triplane. 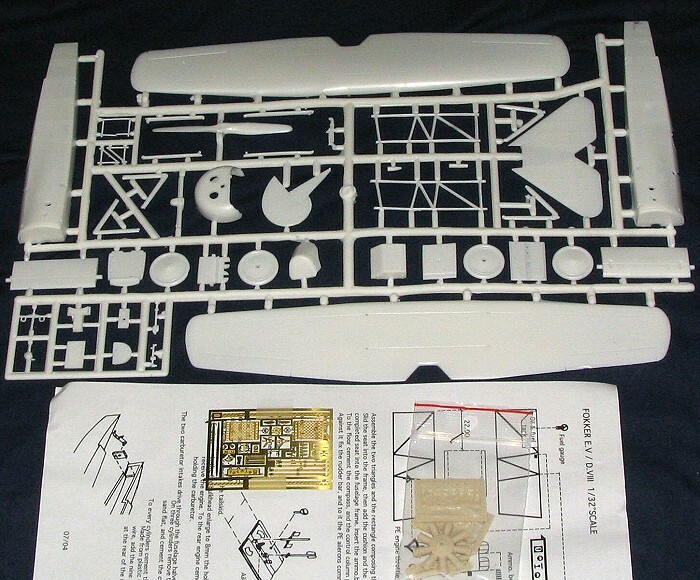 Mention Battle Axe to anyone who has tried to build their F-84G kit from a decade back and you'll see their eyes glaze over as they recall whatever horrors that kit contained. However, things are not as they were. Battle Axe is one of several French short run kit makers and generally speaking, the French don't seem to have progressed at the same rate as the Czechs when it comes to short run kits. Fortunately, some has been made as a recent review of a Fonderie Miniatures kit has shown. I also think that perhaps this one has made some progress as well and that will have to be seen in the building. 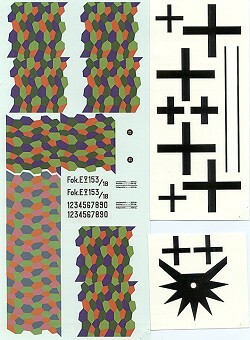 This particular kit is like several WWI kits that have come from this company. There is basically one large sprue that seems to fill the bottom of the good sized, but thin box. The heavy cardboard bottom keeps things relatively safe, though I did notice a few broken parts (all small bits) and what seemed to be some sort of dent damage on the trailing edge of the wing. The parts themselves are fairly well detailed, though not with the crispness of some companies, and there is evidence of some detritus getting into the molds on a few bits, but nothing that can't be easily removed. The sprue attachment areas are quite large and in some cases intrude into the part itself. A razor saw is recommended for part removal. While cutting bits off I found it easy to do as the plastic is thick, but soft, so easily cut. There is flash on a lot of parts and while the big bits have some hefty ejector pin towers to remove, the small parts are all free of these things. It has always been a concern amongst Fokker fans that the upper wing may not be the proper shape. Revell messed up theirs on their big D.VII and so I cut off, sanded and test fit the wing on this one. It seems to me to be the proper shape as it is somewhat flat on the center section and tapers to the tip on both the upper and lower surfaces. Resin is used for the more highly detailed parts such as the engine, machine guns and the valve actuating rods. Photo etch is used for the control horns on the flight control surfaces, seat belts and shoulder harness (though I'm not sure the harness was actually used back then), lower fuselage fabric lacing, some gauges, gun cooling jackets and a few other bits. The builder will have to manufacture other engine parts (like the exhaust and push rods) out of sprue or plastic rod. Instructions are a single piece of standard sized paper with a written construction sequence and well done drawings to accompany each step. They are well written in English so that is a huge help. The builder will have to modify some of the kit parts to properly fit, but that is all spelled out in the instructions. 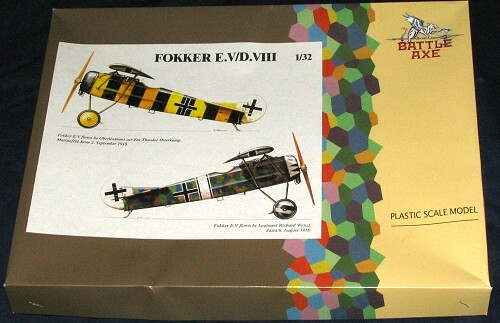 Markings are for two planes as shown on the box art. The upper aircraft is Theodor Osterkamp's aircraft from MFJ 2 in 1918. The lower aircraft is Richard Wenzl's from Jasta 6, also in 1918. The decals are quite well done and nicely printed. It doesn't look as if there is enough lozenge to cover the plane, but since the wing and much of the forward decking is Olive Green, that leaves plenty. It has been quite a while since I've done a WWI aircraft and this one looks like a good one to do. It has minimal rigging so we with 'the phobia' will not have to worry about it. It also seems most complete for a short run kit and its size is such that one should be able to work through any fit situations with no problem.